In my quest to rid my life of as many disposable plastic items as possible, one of the things I have been meaning to change for a while now is my plastic razor. So at the end of last year, when my plastic cartridge razor gave up on me, I decided to make the change and give this safety razor a try! 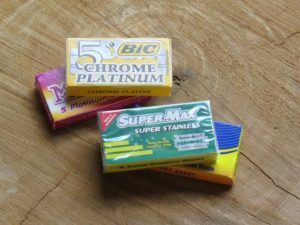 Unlike the disposable cartridge razors most of us are used to, safety razors, which are made of metal, are made to last. The head of the razor is fixed at 90 degrees to the handle and it uses a single blade, which needs to be replaced after a couple of shaves (around 6-10 shaves). I contacted Jaco from Bundubeard/Bundubaard and he kindly sent through a package of razors and shaving products for my husband and I to try. The great thing about Bundubeard is that they strive to be as eco-friendly as possible. Our parcel from Bundubeard arrived in a brown cardboard box, with our products nestled in shredded paper and wrapped in newspaper – unlike the plastic and bubble wrap most companies use to deliver their products in. 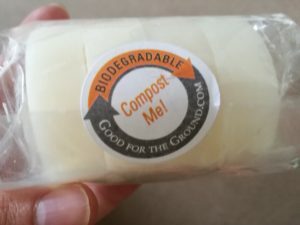 The small amount of plastic that was used to package the soaps was made from a completely compostable film made by Good for the Ground. Not only do Bundubeard supply an amazing selection of stainless steel razors and accessories, like shaving brushes, but they also stock a selection of eco-friendly soaps, oils and creams. We received 2 bars of Bundubeard shaving soap, a shaving soap bowl and brush, as well as some shampoo bars to try out. 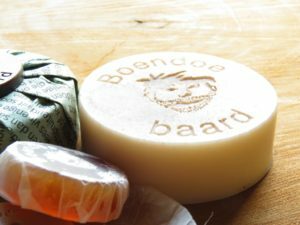 The Bundubeard shaving soap bars are made largely from natural products with a glycerine soap base. So while not entirely natural, they are definitely better than most. This soap lathers beautifully, making it ideal for shaving. The soaps can be ordered in a variety of fragrances, from coffee and vanilla to rooibos and tea tree, and cost R79.00 a 250 gram bar. They also sell a smaller, cheaper body soap bar, at R19.00 (100 gram), which probably doesn’t lather as well, but buying a combination of the two and using the shaving soap only for shaving would be more the economical option. These shampoo/conditioner bars are better for guys and girls with short hair as I found I struggled to get the bars to lather well enough in my longer hair without making my hair knotted. If you do have short hair though, and would like a cheap, easy, biodegradable way of washing your hair then these are perfect for you. The little shampoo bars come in packs of 4 for R60 and also come in a wide range of fragrances. The shaving soap is moulded into the bottom of the bowl. When it’s time to shave, you work it into a lather with a wet shaving brush, and then lather it onto your face. This is without a doubt my husband’s favourite item. He LOVES the foam that the soap bowl makes – and it’s natural and free of chemicals, unlike most of the commonly available shaving creams and gels. 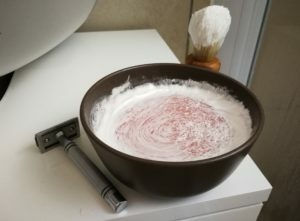 Once you have finished shaving, you just let the bowl dry out and pack it away for next time. Neither my husband nor I had ever used a safety razor before and we were a little apprehensive and worried that we might cut ourselves, so we turned to YouTube for some assistance. We soon found loads of useful videos on how best to use a safety razor – if you want to chuckle at people pulling strange faces and raising their nostrils to the mirror/camera, these are doubly worth a watch. 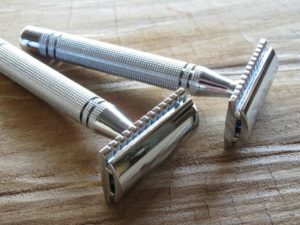 There are plenty of people, guys and girls, who have made the switch to a safety razor and haven’t looked back, despite having to be a little more careful when shaving. The razors we tried are made of chrome and use a standard double edge single safety blade. To insert the blade, you screw the top off the razor and slip the blade into place over the pins and then screw the head back on – nice and simple. 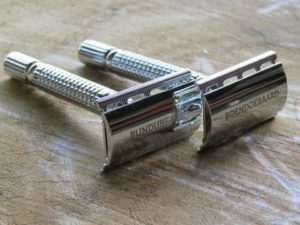 I opted to try the DE1, which is the smaller and more light weight safety razor that Bunudbeard has on offer. It weighs just 68 grams and at just 9.3 cm long is easy to pop into my toiletry bag when travelling. Even better, it costs just R100, which is a good deal cheaper than most women’s razors in shops. And this one will last you years, without having to purchase expensive blade refills every few months! My husband, Graeme, tried the heftier DE3, which has the heaviest metal handle in the range, offering more grip with its knurled finish. The hard chrome finish adds durability and makes for easy cleaning. For guys who like a heavier razor in their hand while shaving, this weighs 112 grams and is 10.8 cm long. This razor costs R350. There is a selection of razor blades and brands to choose from. And they cost just R8.50 to R17.90 for a pack of five blades! Compare that to the R150 or so for a replacement cartridge of blades for your Gillette or Schick razor. The blades are made from stainless steel and are therefore recyclable. I have been using the safety razor for the past 2 months to shave my legs and under arms and I think it’s great! Surprisingly, it hasn’t been a huge adjustment at all. I just need to focus a little more when shaving (not a bad thing) and change the blade after about 7/8 shaves, which for me is not even once a month. In two months neither of us has had a bad cut (only very minor nicks). Both my and my husband’s skin seems happier too. The theory is that because it is only one blade going over your skin, and not multiple blades like in cartridge razors, there is less irritation and fewer ingrown hairs. I am not terribly susceptible to ingrown hairs, but I think this makes a lot of sense. The only downside is that you do have to focus a little more when shaving, as they aren’t as ‘safe’ as cartridge razors. Having said this, you’re not all that likely to cut yourself; you just do need to concentrate a bit harder and not rush. It’s takes a bit of trial of error to get the angle right (as the head of the razor doesn’t swivel like a cartridge razor), but once you’ve got the hang of it, it gives a wonderfully smooth shave! Depending on how often you shave and how thick your hair is, you will probably need to change blades after about 6-10 shaves (guys probably more often than girls). You can tell that it’s time to change your blade when the shave isn’t as smooth. I love that I no longer need to support the disposable/plastic razor industry by buying a new plastic razor every few months. In America it is estimated that 2 billion razors are thrown away each year! And of course, I’m a fan of how affordable it is. It doesn’t cost any more than a good plastic razor – in fact in the long run it’s far cheaper. The chrome razor should last a lifetime. The stainless steel blades are easy to find and are very affordable – you can easily buy a year’s supply in one go. The razors themselves are great quality and easy to clean (the head does need a bit of a clean every now and again). Overall, these razors and associated products are a win! They make for a great gift, and Bundubeard have a range of different options depending on your budget. Even if you don’t replace your razor, the soap bowls, soaps and brushes alone are a fantastic – and all eco-friendly. Takes a little bit of practice to master the technique. Where you can get these products? You can check out their site for details on all their products and pricing. 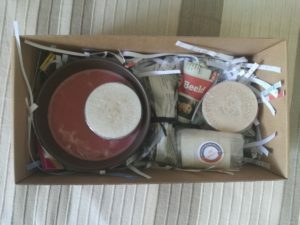 All Bundubeard products can be bought directly through their online shop and delivered to your door www.bundubeard.co.za. Environmental consultant passionate about conservation and wild places. I believe that with a little bit of effort we can reduce the footprint we leave on our beautiful planet, learn to live in harmony with the natural world and support local people and communities along the way. Hi Romy, thanks for a thorough review!